The 10 Best Places for Bubble Tea in Utah! If you haven’t yet experienced the delicious magic of bubble tea, you must visit one of the excellent bubble tea spots in Utah. This Taiwanese beverage is a tea base combined with either fruit of milk, complimented by chewy, delicious tapioca balls. If you’re in the mood for a fun, fruity, and satisfying drink, check out the 10 best places for bubble tea in the state. Swig is one of Utah’s go-to spots for drinks and sweets. The place skyrocketed to popularity a few years back with its famous “Dirty Diet Cokes” and signature sugar cookies. In addition to a variety of different menu items, Swig also sells bubble tea in seven flavors: Thai coconut, pina colada, chocomotion, sour raspberry, creamy avocado, purple Oreo, and mango bango. Seven Serenity Day Spa and Tea Café is a relaxing spot in Utah County that is more or less obsessed with helping you to feel relaxed and comfortable. And while they are known for their hot and cold organic teas, they also sell authentic bubble tea with classic tapioca pearls and mouth-watering fruit flavors. While you may want to go to Seven Serenity Day Spa for the bubble tea, it will be pretty hard to leave without also trying their spa services. Pho Plus is a popular Vietnamese restaurant with two locations in Utah Valley. Along with pho, stir fries, vermicelli plates, and combination plates, Pho Plus serves up delicious tempura ice cream and classic bubble tea. Flavors include peach, mango, lychee, strawberry, raspberry and taro. If you’re not tired of slurping after your pho, bubble tea makes for a nice post-dinner treat. Watchtower Café is Salt Lake City’s most “comical” coffee shop. But really, this place actually specializes in mixing coffee and comics. The shop also attracts gamers, who can game with friends while enjoying a bit of coffee, specialty soda, lemonade or bubble tea. Watchtower Café’s bubble tea flavors are definitely far from standard. You can choose from the “Star Wars” inspired “BB-8” (blended Thai iced tea, Tongan caramel, and “beep boop”), the “Lumpy Spice Princess” (blueberry, taro, lavender), “Super Saiyan” (pineapple, li-hing, and fresh squeezed lemon), and “Donatello” (hot jasmine green tea, avocado, steamed milk, and violet). At the Tea Bar, bubble tea is the name of the game. Unlike most places in Utah that sell bubble tea, the Tea Bar has a very wide variety of flavors, mix-ins, and bases. Your bubble tea can be milk tea, green tea, or black tea, and if you want to get really creative, you can even mix flavors. The Tea Bar attracts a regular crowd of true bubble tea lovers. With three locations in Utah (St. George, Sandy, and Springville) the Orange Peel specializes in bubble tea and smoothies, and its bubble tea actually shares some similarities with the traditional smoothie—it is creamy, refreshing, and naturally colorful. Like the Tea Bar in Salt Lake City, the Orange Peel has an impressive selection of bubble tea flavors, including cantaloupe, orange cream, cocoa bean, avocado, strawberry, and passionfruit. At Pearl Milk Tea Club, cute plastic cups filled with milky, fruity goodness entice even the biggest bubble tea skeptics. Whether you like your bubble tea hot or cold, you will like the sight of beautiful, plump tapioca pearls at the base of these perfectly slurpable beverages. You’ll probably also be tempted to grab some Hi-Chews on your way out of the shop. Café Yugo is a popular stop for all things Asian fusion. And even if you come for the sushi and ramen, you should stay for the bubble tea. 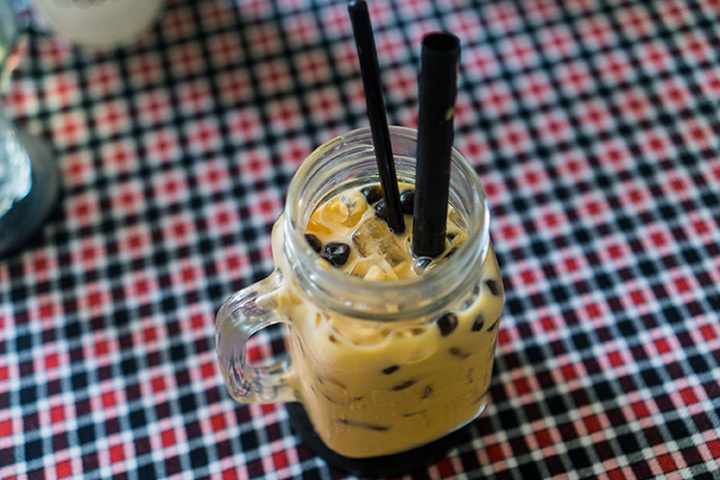 In addition to what they call “Boba Smoothies” and “Boba Coffee” (both of which are essentially smoothies and coffee with tapioca pearls added to them), Café Yugo also serves traditional bubble tea in interesting flavors such as match, mango lychee, honeydew, and chocolate. If you feel so inclined, you can also add extra toppings to your bubble tea, such as popping boba, fruit jelly, and grass jelly. Green Panda Café is an understated, jack of all trades Chinese restaurant hiding in a Provo strip mall. Nevertheless, it is a fantastic spot for lunch or dinner, not only because of its low prices, but because of its delicious food. Boba (or bubble) smoothies and slushies are some of the restaurant’s most popular menu items. With the option to add extra tapioca pearls or even a scoop of ice cream to your bubble smoothie or slushie, all of the restaurant’s quintessential flavors (strawberry, strawberry banana, honeydew, lychee, mango, taro, almond, watermelon, etc.) really stand out. Even though it’s named after boba/bubble tea, Boba World (which is both run and owned by the same charming family) also has a strong reputation for delicious, fresh food. If you have the opportunity to order one of their fresh, far-from-artificial boba drinks, you should also consider trying their pineapple chicken and potstickers, both of which are crowd favorites.